© The Willem de Kooning Foundation/Artist Rights Society (ARS), New York, New York. Photograph by R. H. Hensleigh and Tim Thayer. Willem de Koening is best known as a leading New York Abstract Expressionist painter. Trained in art and design in Rotterdam, he moved to New York in 1927. Seeking intensity, he transformed his early elegant Cuba-Surrealist canvases into the dramatic rough surfaces and vigorous shapes of his mature female figures and landscapes. 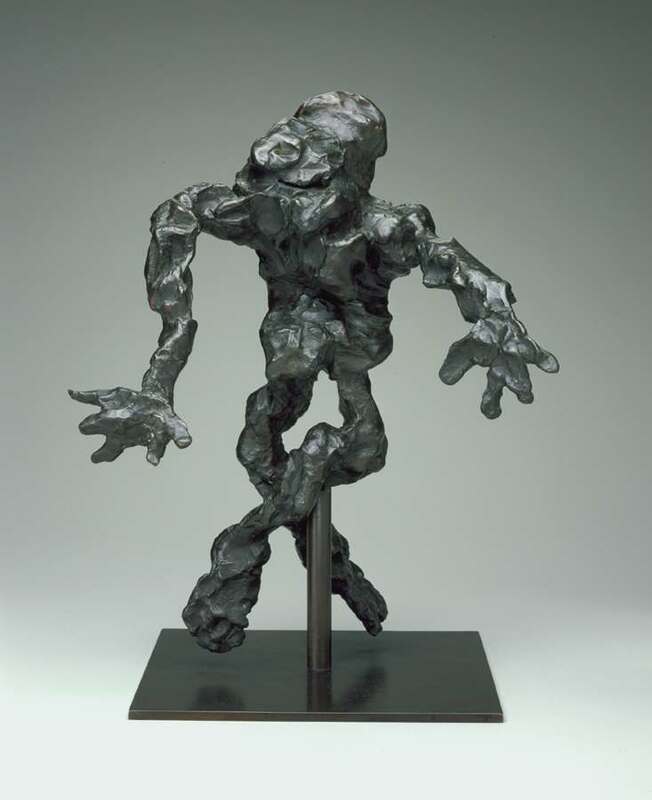 One critic dubbed his brawny ladies “tipsy trollops.” In Rome in 1969, he began a five-year exploration of the figure in three-dimensional bronze. Some were life-size. Many, like Cross-Legged Figure, are of a more intimate scale. Created with closed eyes to intensify the “feel” of the shapes, these bronze figures seem ripped from the paintings into three-dimensional space, exchanging their ponderous painterly womanhood for a pan-human vitality. This jaunty dancing figure appears to have been fashioned in an instant, recalling Rodin’s practice of squeezing coils of clay into figures as he watched models move about the studio.